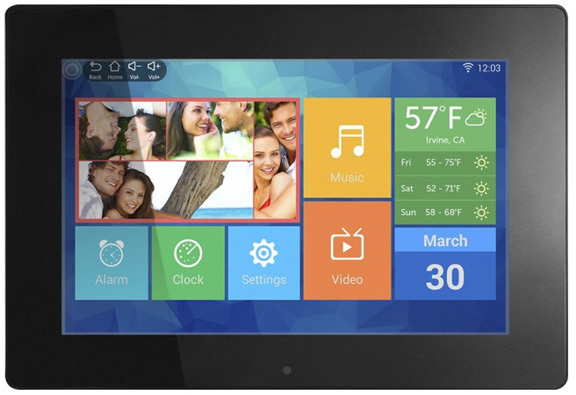 Los Angeles, California (July 8, 2016), Aluratek, a supplier of digital photo frame, is launching a cloud frame at Best Buy with an app, 10” for $159, Model: AWDMPF110FSKU: 5254701. It is said this model has an app which makes adding pictures much simpler. With 1280×800 IPS screen, the image looks clear and beautiful, and the mosaic layout on home screen looks in accordance with the popular design of IT products. According to product descriptions, this frame bundles with the user’s smart phone, and with an app, it is easy to transfer photos from user’s cell phone to the frame. However, when I studied and compared with the current cloud frame in the market, I found this is not a cloud frame. Firstly, this model does not have any cloud features, and it does not provide user’s with cloud storage. All the photos transferred from a cell phone should be stored in the on-board memory. Supposing it is a 8GB built-in memory card, the available storage capacity should be around 5 GB, and it will be fully occupied quickly. Although an SD slot allows you to expand storage to 32 GB, the memory card is one of the more easily lost items. Secondly, Aluratek’s WiFi model does not allow users to go to the server to manage their contents remotely. I do not think it allows different family members to create and manage their own photos folder on the server platform remotely. You can imagine what a mess it will be when thousands of photos are congested in the memory card. It cannot allow grandma to enjoy family members’ photos in good organization and order. Thirdly, I found this model’s appearance is almost exactly the same as Sungale’s 10” cloud frame. The only difference is that Aluratek’s model has added a navigation key on the back, making it obvious that Aluratek wants to improve file search and management by the navigate key, but if it has thousands photos, does a navigate key work? Does it have any special relationship between Aluratek and Sungale? Generally, this Aluratek W-Fi frame is with a hi-resolution screen, but at a lower level comparing with a true cloud frame. Interesting… I don’t know what to expect from Aluratek, but it does seem that they have a product that isn’t quite as good as some others. Maybe I’ll do a little more research before committing to purchasing their frame and figure out which Brand and Model really is best. It is not my first time to visit this site, i am visiting this site dailly and obtain nice data from here every day. Thanks, I’ll check on this issue. are have a transparent concept of the place they need to be investing their cash to get the very best returns. your amazing website you have developed here. job that I crammed out the application. Normally I don’t read article on blogs, however I would like to say that this write-up very forced me to check out and do it!